Want to know more about how technology can be used in seizing business opportunities? Learn more business tips from ’technopreneurs’ through this upcoming event. 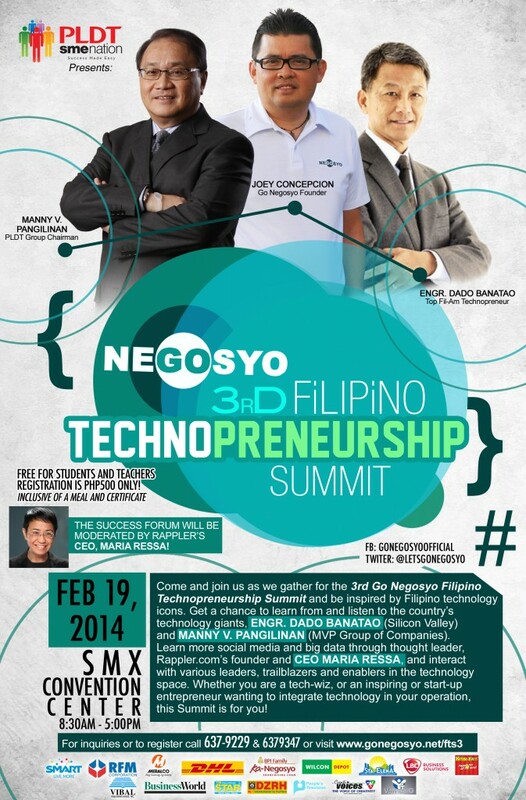 True to its commitment of helping transform the Philippines into an entrepreneurial nation, the Philippine Center for Entrepreneurship, Inc. – Go Negosyo is holding its 3rd Go Negosyo Philippine Technopreneurship Summit on FEBRUARY 19, WEDNESDAY at the SMX Convention Center in Pasay City. This Summit is centered on reinforcing the entrepreneurial spirit of the Filipino people by engaging them in the powerful realm of technology. The summit above all else aspires to inspire future Filipino technopreneurs who will harness and maximize the powerful duo of technology and entrepreneurship for one’s economic empowerment and as an important contribution to the nation. The event also aims to enjoin the participants to develop a positive change in their mindset, and empower them with relevant entrepreneurship tools and concepts as their key to success. The 3rd Go Negosyo Philippine Technopreneurship Summit is a one-day event that will feature different topics on technopreneurship in the form of inspiring keynote addresses and plenary forums. The event is expected to feature Filipino technopreneurs who were able to make it big in the borderless and ever-dynamic world of technology, even those who conquer Silicon Valley proving to the world Filipino ingenuity and technology-savvyness. The event will also highlight business models by featuring successful techno-enterprises in the fields of mobile applications, wireless applications, software development, game design and development, ecommerce, website development and even blogging, in the hope to empower the future generation. The event aims to gather students, teachers and young and working professionals in the hope to give them a glimpse of Filipino technopreneurship which is a fairly untapped sector which can still be maximized for our collective gain as a nation.